Not to be confused with “The Age of Reason; Being an Investigation of True and Fabulous Theology” by Thomas Paine. 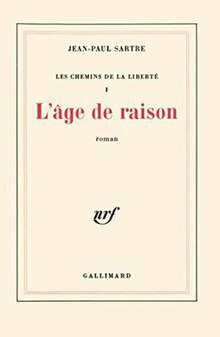 The Age of Reason (French: L'âge de raison) is a 1945 novel by Jean-Paul Sartre. It is the first part of the trilogy The Roads to Freedom. The novel, set in the bohemian Paris of the late 1930s, focuses on three days in the life of a philosophy teacher named Mathieu who is seeking money to pay for an abortion for his mistress, Marcelle. Sartre analyses the motives of various characters and their actions and takes into account the perceptions of others to give the reader a comprehensive picture of the main character. The Age of Reason is concerned with Sartre's conception of freedom as the ultimate aim of human existence. The work seeks to illustrate the existentialist notion of ultimate freedom through presenting a detailed account of the characters' psychologies as they are forced to make significant decisions in their lives. As the novel progresses, character narratives espouse Sartre's view of what it means to be free and how one operates within the framework of society with this philosophy. The novel is a fictional reprise of some of the main themes in his major philosophical study Being and Nothingness (1943). One of the notions is that ultimately a person's freedom is unassailable as it is fundamentally part of the nothingness that is the imagination and so cannot be taken away or destroyed. There has been a mixed response to The Age of Reason. As of January 2017 the book has been rated 9,666 times on GoodReads with an average score of 3.97 stars out of a possible five. The Harvard Crimson published an unattributed review of the book in 1947 which states "Sartre's new novel is a rare and welcome plant in a period that almost completely lacks a balanced combination of emotional intensity and maturity in its writers." However, the review goes on to remark how Sartre seems to be preoccupied with describing the physical act of vomiting. ^ Sartre, Jean-Paul. 1947. “The age of reason; a novel” (Translated to English by Eric Sutton) Vintage Books. New York. 397 pages. ISBN 0-394-71838-0 (paperback). ^ "The Age of Reason". www.goodreads.com. Retrieved 2018-01-11. ^ "The Bookshelf | News | The Harvard Crimson". www.thecrimson.com. Retrieved 2018-01-11. This page was last edited on 10 April 2019, at 03:04 (UTC).